You have a vacation home in Vermont (I keep picturing Killington because I had to go to this conference there in November). 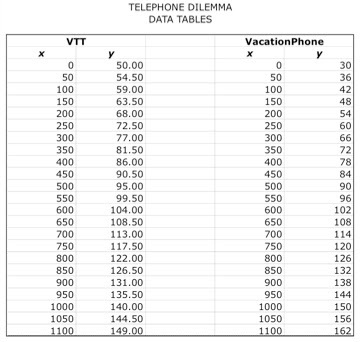 You have a choice of two phone providers: VTT and VP. VP rates: $30 installation and 12￠a minute. VTT: $50 installation and 9￠a minute. We need at least 3 methods to solve the problem: graphing, a table, and simultaneous equations. 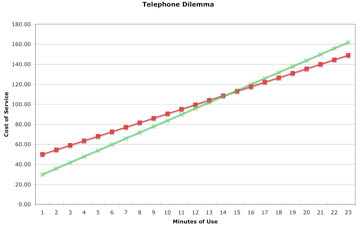 The graph is above BUT I can't figure out in this new version of Excel that I have how to adjust the scale. As soon as I get my hands on the older version on Monday, I'll fix it up in a jiffy.